B0934. HEINRICH SCHLUSNUS. Plaudereien um Heinrich Schlusnus. Berlin-Charlottenburg, self-published by the Author, to be sold at his concerts, 1935. 48pp. (German Text) There is an outline of his life and career up to the time of the book’s appearance and includes many photos from his life as an artist and a private citizen. 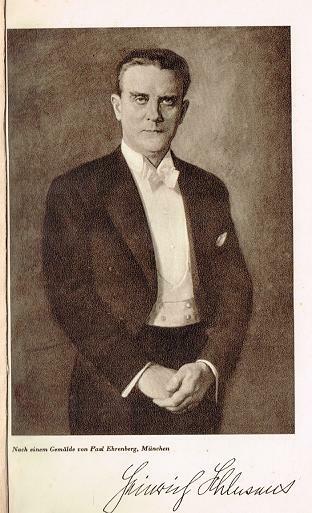 "Heinrich Schlusnus was one of two outstanding German baritones (the other was Gerhard Hüsch) who were most prominent in opera performances and lieder singing in Germany in the period between the wars. 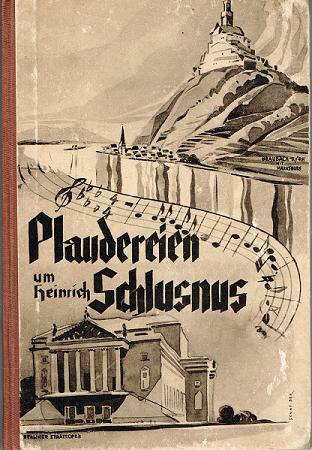 Schlusnus was renowned as the leading Verdi baritone at the Berlin State Opera for almost 30 years (1917-45) and also gave more than 2000 lieder recitals all over the world….He had a warm, exceptionally smooth, and beautiful voice with the strong high register needed for some of the big Verdi roles."